This Christmas I have a gift for all of the BlackBerry users who have supported me over the years. 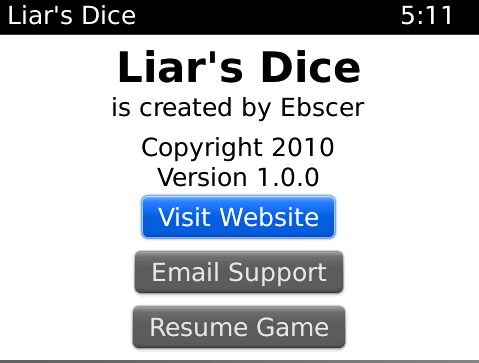 Starting today the game Liar’s Dice is available to be downloaded for free with the promo code “CHRISTMAS”. This gift will be can be redeemed in BlackBerry World until the end of 2014. 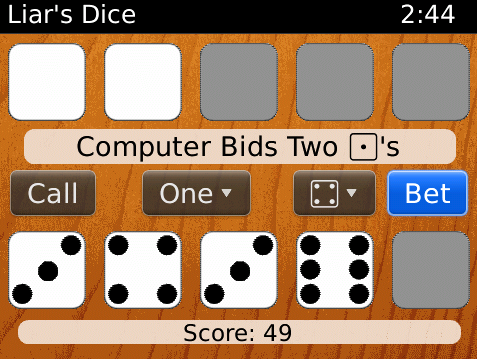 Liar’s Dice has been updated to version 2.4 in BlackBerry World in order to add support for the newly released BlackBerry Passport and BlackBerry Classic phones. This is a classic dice game of strategy and deception in which seeing only your own dice you must bet on the combined dice in play without getting caught in a lie. The object of the game is to catch your opponent (the computer) betting too high. 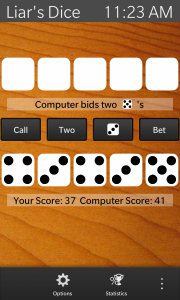 Bets are placed on both your own dice which you can see, and your opponent’s dice which are hidden from you. You begin each round by making a bet. The computer then has an opportunity to either call your bet a lie, or to bet higher then you. Then it is once again your turn to call your opponent’s bet or to bet even higher. This continues until eventually a bet is called. Then if the bet is too high the caller wins, or if the bet is not a lie, the bettor wins the round. The game has two main game modes. The “High Score” mode is the default mode, points are awarded for each round, and the first to gain a given number of points wins. The number of points required to win a game can be configured on the options page in order to allow for shorter or longer games. 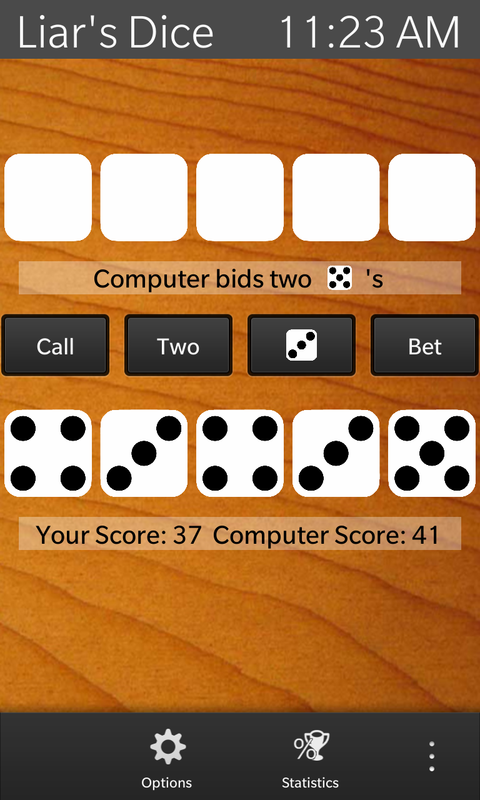 The other option is for an “Elimination” mode in which the loser of each round loses one dice for the following rounds, and the last player with any dice left is the winner. This game is more dynamic as there are a different number of dice in play each round. Additionally games in this mode typically play faster than high score games. 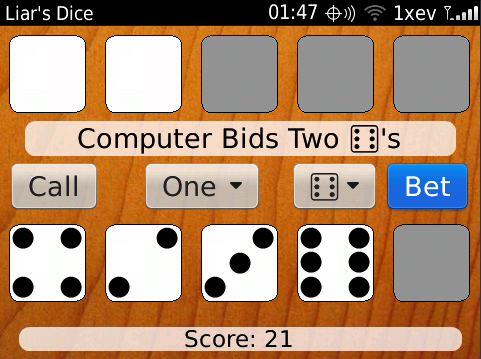 The Liar’s Dice game has been updated to version 2.3 in BlackBerry World. This new version of the app is more responsive, and makes the app as a whole more efficient. 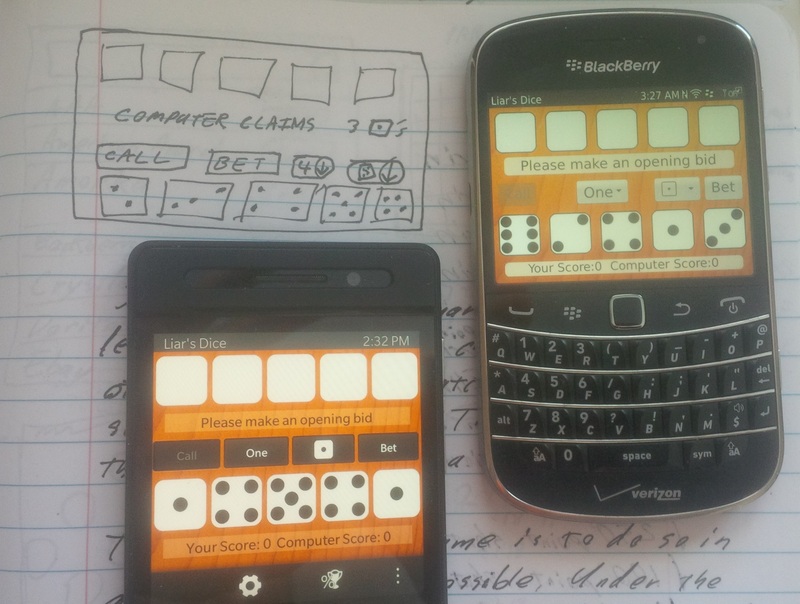 I came across an early sketch for the design of the Liar’s Dice app. While there have been a few changes, you can see that the original idea mostly held true over the years. 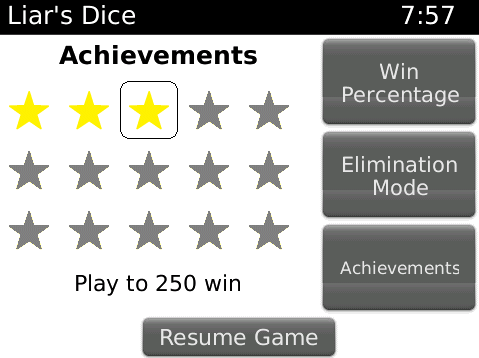 Liar’s Dice has been updated to version 2.2 in BlackBerry World. This new version has a smaller instal size, and also adds support for a swipe-down menu. Liar’s Dice has been updated in BlackBerry World to version 2.1 in order to add support for the BlackBerry Q10 which is launching this weekend. Liar’s Dice has been released in AppWorld for BlackBerry 10. 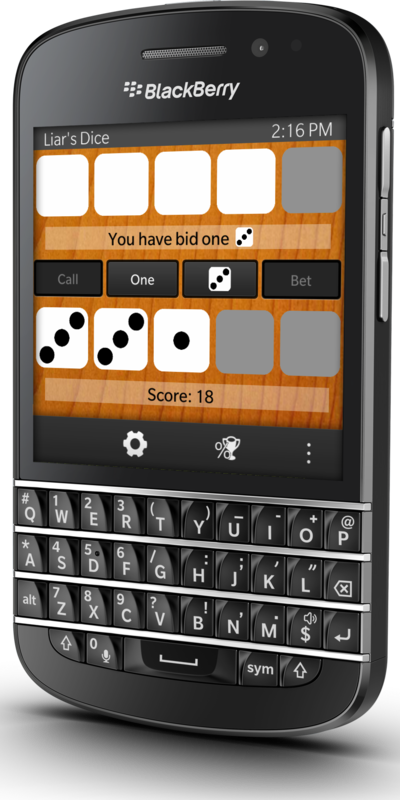 Like the recent update to 10,000 Farkle, the game has been completely rewritten, but anyone who has purchased Liar’s Dice on their current BlackBerrys will be able to download the new BlackBerry 10 version of the game for free through AppWorld. 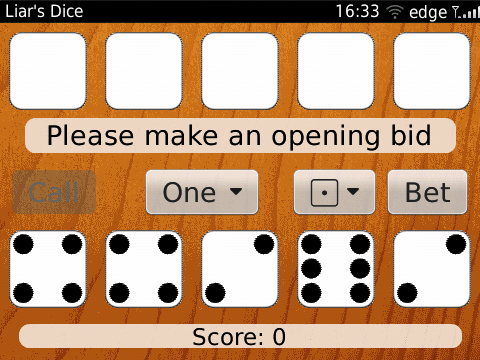 The Liar’s Dice game has been updated to version 1.4 in BlackBerry AppWorld. New in this version is the ability for games to persist over playing sessions. You can now exit the app at any time during the game, and simply resume play when you start the app again. Other changes were made to improve the the efficiency of the app, and the look of the menus. The game has two main game modes. The “High Score” mode is the default mode, points are awarded for each round, and the first to gain a given number of points wins. The amount of points that the game plays to can be selected from the options page, allowing for shorter or longer games. The second game mode is an “Elimination” mode in which the loser of each round loses one dice for the following rounds, and the last player with any dice left is the winner. This game is more dynamic as there are a different number of dice in play each round. Additionally these games in this mode typically play faster than high score games. 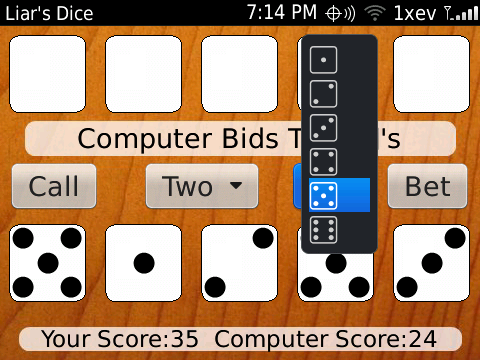 Liar’s Dice has been updated to version 1.3 in BlackBerry AppWorld. 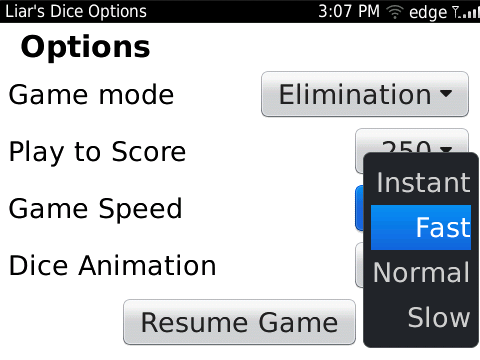 This new version adds support for the recently released OS7 devices, and also adds integration with the native options menu, for users of all devices. 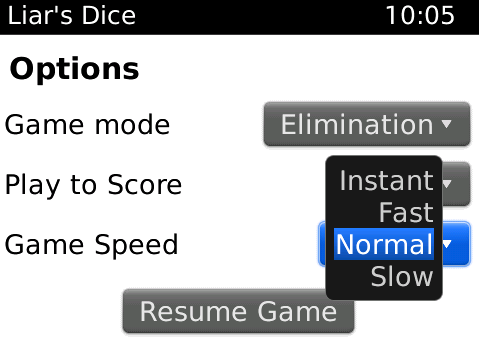 Liar’s Dice has been updated to version 1.2 with better OS 6 support, crisper graphics and a smaller file size. 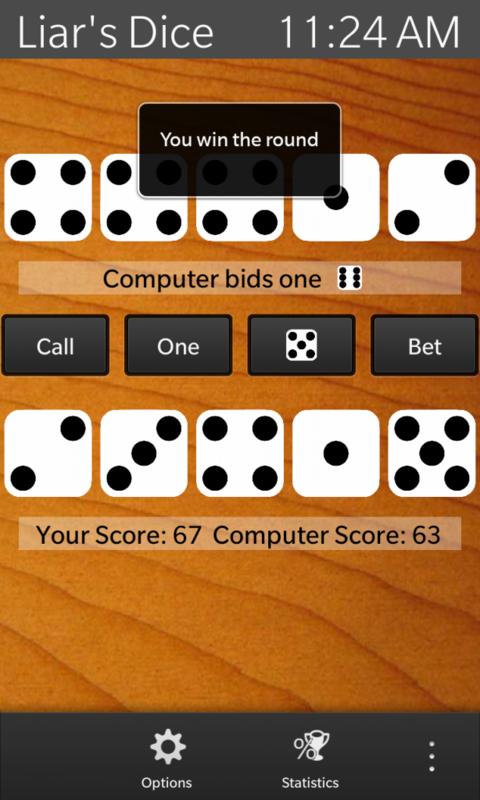 This application is a dice game of strategy and deception in which seeing only your own dice you must bet on the combined dice in play without getting caught in a lie. The game is popular in many different cultures and is also known by the names Perudo, Dudo, or Cachito. This version adds improved support device running OS 6.0 making use of some new API’s that are available in the newer operating system. The graphics have also been cleaned up a bit on all devices, giving the images a crisper look. Also the overall file size of the application has decreased for all devices by an average of 17.7%. Version 1.2 of Liars Dice requires OS 5.0+ and supports the 8350i, 8520, 8530, 8900, 9000, 9300, 9330, 9500, 9520, 9530, 9550, 9630, 9650, 9700, 9780, and 9800. 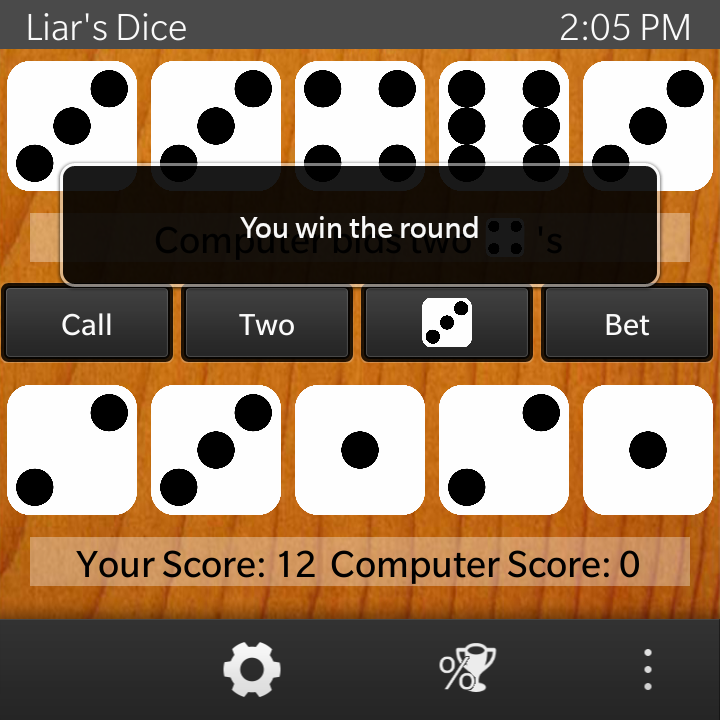 Liar’s Dice is a recently released game for BlackBerry that is based off of the classic dice game of strategy and deception. 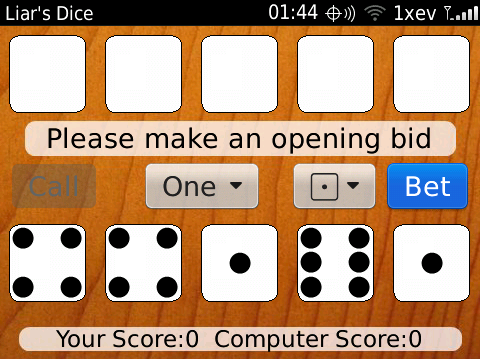 The game involves seeing only your own dice you must bet on the combined dice in play without getting caught in a lie. It is also known by the names Perudo, Dudo, and Cachito. Version 1.1 of the application adds support for more devices as well as a few additional features. BlackBerry Curve 85xx and 93xx devices as well as the Bold 9000 are now supported (although still requiring a minimum operating system of version 5.0). 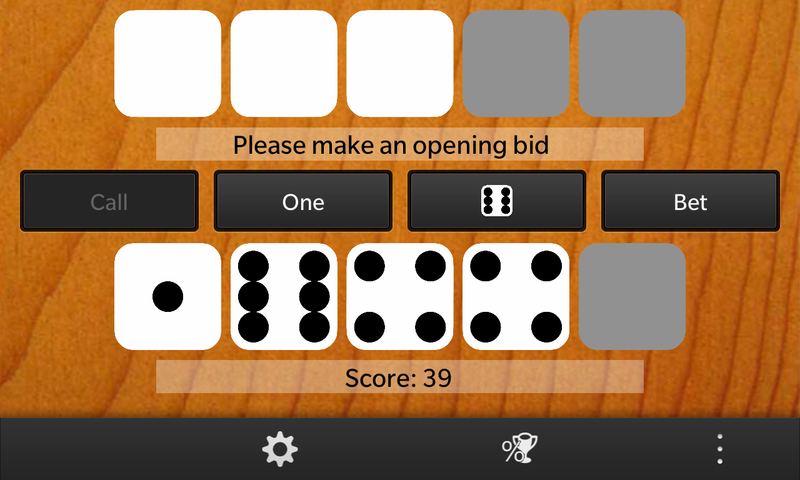 In addition, the application has been optimized to run smoother, make the dice roll animation optional, add icons to the menu options, as well as a few bug fixes. Version 1.1 of Liars Dice requires at least OS 5.0 and supports the 8520, 8530, 8900, 8910, 9000, 9300, 9330, 9500, 9520, 9530, 9550, 9630, 9650, 9700, and 9800. It is anticipated that the 9780 will be compatible as well when it releases early next month. 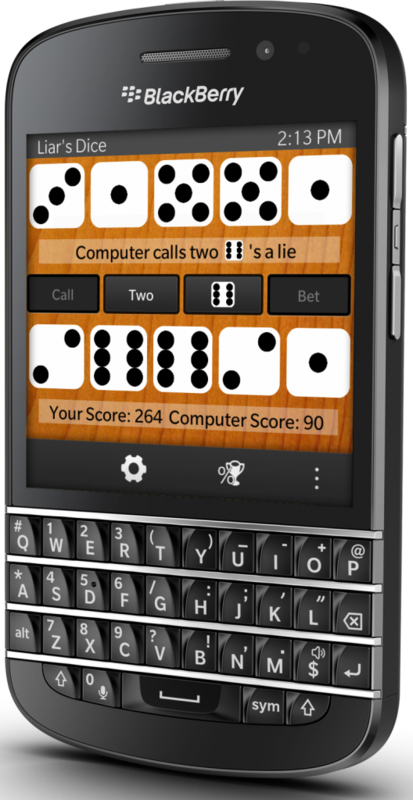 Liar’s Dice is a new BlackBerry game, that is available today. 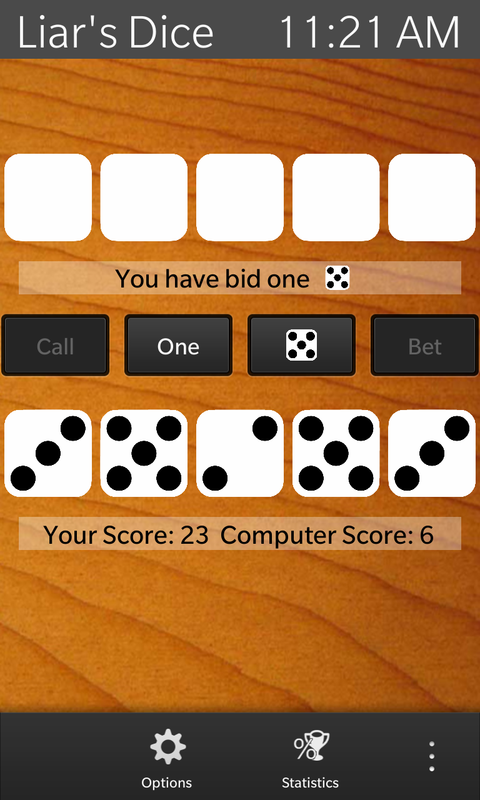 This application is based off of the classic dice game of strategy and deception in which seeing only your own dice you must bet on the combined dice in play without getting caught in a lie. The game is popular in many different cultures and is also known by the names Perudo, Dudo, or Cachito. In celebration of its release Liar’s Dice will be available in BlackBerry AppWorld for $2 dollars off of the normal price through October 15th. 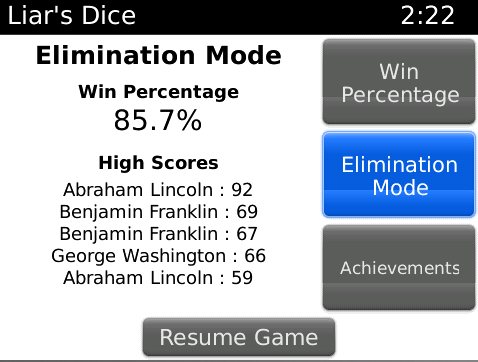 Version 1.0 of Liars Dice requires at least OS 5.0 and supports the 8900, 9500, 9520, 9530, 9550, 9630, 9650, 9700, and 9800. 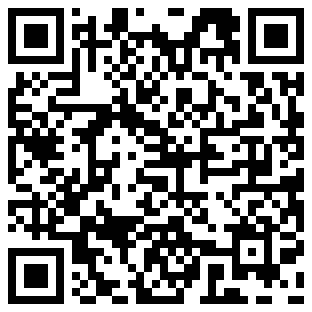 Version 1.1 of the application will add support for more devices in the near future.